A cross faith necklace is a simple beaded accessory consisting of rainbow-colored beads arranged in the shape of a cross. 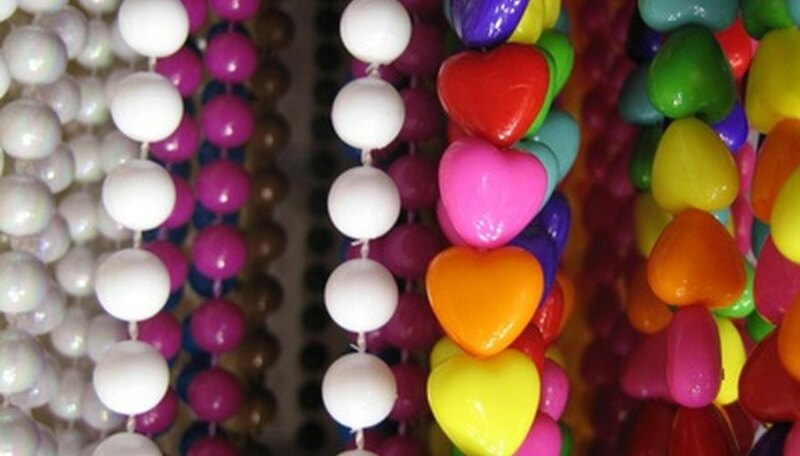 There are usually six beads on the necklace, each one having a unique color that symbolizes a Christian principle or ideal. These beaded cross faith necklaces make ideal crafts for Sunday school or vacation Bible school projects and can also make heartfelt handmade gifts for a Christian friend or family member. The black bead represents sin; Christians believe that their sins separate them from God and that they should repent of their sins to repair their relationship with God. The black bead on the necklace reminds Christians that sin may be a part of their lives but that they should strive to overcome it and repent whenever they commit a sin. Red symbolizes the blood of Jesus Christ, shed during his crucifixion for the salvation of his people. Christians believe in the atoning power of Christ's blood, which factors in heavily as a symbol during Christian church services during the Communion portion of the service. The red bead on a necklace reminds Christians of Christ's sacrifice, which allows them to live a Christian lifestyle and return to heaven after death. White represents the purity that comes after the cleansing of repentance. Christians believe that if they repent of their sinful acts, they can be made pure again; God's love will cleanse them and allow them to move forward, free of their sins. This white bead on the necklace reminds Christians of the cleansing benefits of repentance and reinforces the desire to live a pure life. The blue bead represents the waters of baptism. Christians are baptized to signify their entrance into the Christian faith. They believe that baptism cleanses them of their sins and symbolizes their desire to live a Christian lifestyle. Through baptism and the repentance of and forgiveness for their sins, they are permitted to live in heaven after they die. The green bead represents growth. Christians believe that as they live a Christian lifestyle, their faith will grow, and they will eventually live more Christ-like lives. This growth is very important to the Christian journey because followers of the faith try to make themselves worthy of an eternal life in heaven through their growth as Christians. The gold bead represents the reward of an eternal life in Heaven. Thus, the cross faith necklace is representative of all of the steps in the journey of a Christian's life. From sin, they repent and are made pure because of Christ's atoning sacrifice and the shedding of his blood. Then they can be baptized and grow in their faith as they strive to lead a Christian lifestyle, and eventually they will be rewarded with eternal life in heaven when they die.